French jihadist “Abu Salman al-Faranci” is a propagandist and recruiter for ISIS. 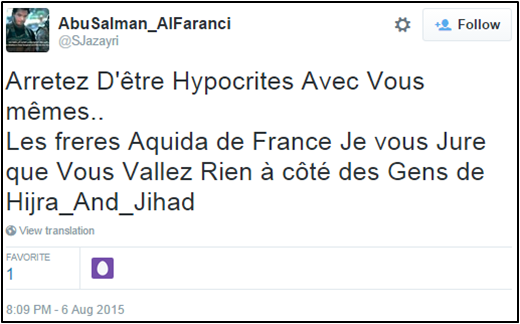 Al-Faranci uses Twitter to propagandize and call on Muslims to make hijrah (migrate) to ISIS-held territory. On August 5, 2015, al-Faranci tweeted, “One who has forsaken hijra [migration] Allah will punish...”AbuSalman_AlFaranci, Twitter post, August 5, 2015, 7:33 a.m., https://twitter.com/SJazayri/status/628936752548454400. The next day he tweeted, “Stop being hypocrites with yourselves… the brothers of Aqeedah in France I swear to you, you are worth nothing compared to the people of Hijra [migration] and jihad.”AbuSalman_AlFaranci, Twitter post, August 6, 2015, 8:09 p.m., https://twitter.com/SJazayri/status/629489517431517184. On August 12, he wrote, “Don’t ask Too many Questions… Don’t let Satan Dominate… Make your Preparations… Heal your Intention… #Hijrah [migration]_Party”AbuSalman_AlFaranci, Twitter post, August 12, 2015, 1:36 a.m., https://twitter.com/SJazayri/status/631383667131199488. In November 2014, Abu Salman al-Faranci appeared in an ISIS video titled “What Are You Waiting For?”Des combattants français de l’Etat islamique appellent les musulmans à commettre des attentats en France,” MEMRI FR, November 20, 2014, http://www.memri.fr/2014/11/20/des-combattants-francais-de-letat-islamique-appellent-les-musulmans-a-commettre-des-attentats-en-france/. The video—produced by ISIS’s Al-Hayat Media Center—features al-Faranci pressuring his audience to make hijrah to ISIS territory. In cases where hijrah is not possible, al-Faranci urges his viewers to “operate within France,” including by terrorizing French citizens and killing them using weapons, cars, and poison. Al-Faranci says: “[P]oison the water and food of at least one of the enemies of Allah. Kill them and spit in their faces and run over them with your cars. Do whatever you are able to do in order to humiliate them, for they deserve only this.”Des combattants français de l’Etat islamique appellent les musulmans à commettre des attentats en France,” MEMRI FR, November 20, 2014, http://www.memri.fr/2014/11/20/des-combattants-francais-de-letat-islamique-appellent-les-musulmans-a-commettre-des-attentats-en-france/. @SJazayriAbuSalman_AlFaranci, Twitter, accessed August 18, 2015, https://twitter.com/SJazayri/status/629489517431517184. Abou Salmane al FaranciAbuSalman_AlFaranci, Twitter post, August 5, 2015, 7:35 a.m., https://twitter.com/SJazayri/status/628937336261332992. AbuSalman_AlFaranciAbuSalman_AlFaranci, Twitter, accessed August 18, 2015, https://twitter.com/SJazayri/status/629489517431517184. Abu Salman Al FaranciDes combattants français de l’Etat islamique appellent les musulmans à commettre des attentats en France,” MEMRI FR, November 20, 2014, http://www.memri.fr/2014/11/20/des-combattants-francais-de-letat-islamique-appellent-les-musulmans-a-commettre-des-attentats-en-france/. WaddaH Salman’sWaddaH Salman’s, Twitter, accessed September 30, 2015, https://twitter.com/SJazayri. 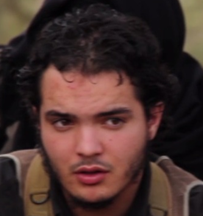 French jihadist “Abu Salman al-Faranci” is a propagandist and recruiter for ISIS. “The Brothers Who Have succeeded to make Hijra [migration] are Not Angels… they could be as attracted to Dunya [the (non-Islamic) world] as to the land of Islam [referring to ISIS-held territory]” (Tweet)AbuSalman_AlFaranci, Twitter post, August 17, 2015, 2:39 p.m., https://twitter.com/SJazayri/status/633392697257160704. “Don’t ask Too many Questions… Don’t let Satan Dominate… Make your Preparations… Heal your Intention… #Hijrah [migration]_Party” (Tweet)AbuSalman_AlFaranci, Twitter post, August 12, 2015, 1:36 a.m., https://twitter.com/SJazayri/status/631383667131199488. “The good life is not In Dubai… the Good Life is Found where one Closes Stores at the [h]our of Prayer..” (Tweet)AbuSalman_AlFaranci, Twitter post, August 10, 2015, 10:50 a.m., https://twitter.com/SJazayri/status/630798475710476289. Allah will punish him strongly…” (Tweet)AbuSalman_AlFaranci, Twitter post, August 6, 2015, 7:35 a.m., https://twitter.com/SJazayri/status/629492513062187008. Reasons not to make hijra [migration]” (Tweet)AbuSalman_AlFaranci, Twitter post, August 6, 2015, 8:14 p.m., https://twitter.com/SJazayri/status/629490748828819456. “Stop being hypocrites with yourselves… the brothers of Aqeedah in France I swear to you, you are worth nothing compared to the people of Hijra [migration] and jihad.” (Tweet)AbuSalman_AlFaranci, Twitter post, August 6, 2015, 8:09 p.m., https://twitter.com/SJazayri/status/629489517431517184. “One who has forsaken hijra [migration] Allah will punish...” (Tweet)AbuSalman_AlFaranci, Twitter post, August 5, 2015, 7:33 a.m., https://twitter.com/SJazayri/status/628936752548454400. “I am your brother Abu Salman and I send a message to my brothers and sisters in the land of Kufr – France. I say to you, be mindful of Allah and fear him. I invite them to perform Hijra [migration] to the land of the Khilafah [“Caliphate” – referring to ISIS-held territory]. And I say to my brothers and sisters, by the grace of Allah we have pledged allegiance to our ameer [leader] and Khalifah Abu Bakr al-Baghdadi. And we renew our allegiance and I also invite you to pledge allegiance, and if you are unable to come to Sham or Iraq, then pledge allegiance in your place – pledge allegiance in France. And if you are sincere in Allah in your worship and in your creed and are unable to make Hijra [migration], then operate within France. Terrorize them and do not allow them to sleep due to fear and horrors. There are weapons and cars available and targets ready to be hit. Even poison is available, so poison the water and food of at least one of the enemies of Allah. Kill them and spit in their faces and run over them with your cars. Do whatever you are able to do in order to humiliate them, for they deserve only this. All praise is due to Allah. We, the French, made Hijra with our families. With our wives and offspring, and with the permission of Allah, they will be raised in this land. They will grow up in this land, the land of the Khilafah, the Islamic State. And they will have children. And these generations will fight you O crusaders and murtadeen [apostates].” (ISIS Video)Des combattants français de l’Etat islamique appellent les musulmans à commettre des attentats en France,” MEMRI FR, November 20, 2014, http://www.memri.fr/2014/11/20/des-combattants-francais-de-letat-islamique-appellent-les-musulmans-a-commettre-des-attentats-en-france/.